Club Penguin Cheats by Mimo777 Club Penguin Cheats by Mimo777: Club Penguin Party Reviewed By You! 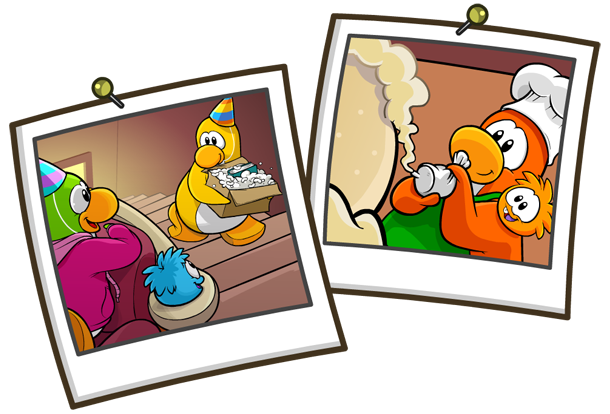 The first Club Penguin party I remember is............The 3rd Anniversary Party!!!!!!!! It was so much fun!!!! we all wore the crazy hats and I remember trying to find the pin especially made fot the party! It was a blue and orange cake with a big orange 3 at the top!!!! For next weeks Reviewed By You, Club Penguin wants to know what's your favorite Halloween Party memory? Remember the Anniversary Party is on October 24th for ONE DAY ONLY! I remember the 3rd Anniversary, as well as the first. Off topic: There's another glitch I found, when you log into a room, some of the penguin names appear in the top left corner. Also sometimes when you click the map, the screen goes dark and you can't do anything except spin around. He must be exited for the party! Hope you can make it! Mimo, like what I did there ^, am I allowed to do that? Because its not a question... but... ya... Just making sure! This year's yearbook is going to be blue! It's that book in the yellow penguin's box! Make sure you submit these glitches to Club Penguin by e-mailing them! I am about a two years old in CP, mostly because my brother played CP and he wouldn't give me a turn. Lol. But the first party I remember is the medieval party. I loved all the knights and princess costumes! I've only been to one Halloween party, so that's my favorite memory I guess. I like the storm, it makes everything look very mysterious. That's all for now! I don't really remember much of it either. I love the costumes, although I've only been to one party. I bet you're right! You must be really observant, I would have never noticed that! The book looks sort of turquoise to me, but I don't know. I wish they would give clues for the party hat color too. Ha ha lol. Is that normal or is he/she mutating? 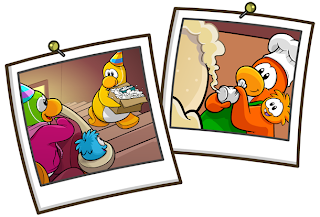 The first anniversary party I went with my old penguin was when the island turned 3 years old(or something like it). Now I'm looking for my first anniversary party! Hi everyone! it’s Mario2903! me and funpenguin have decided to have a mini party! we hope you can make it! it will be on sunday, mukluk, cove 1:00 PST we hope you can make it! don’t miss the clues and wonders about the party! Mimo - Sorry about my modding lately. I've been busy with school and after school activites. And my computer stopped working... its just a big mess. Contact club penguin about this. I haven't noticed this glitch yet since my computer crashed yesterday! I remember getting the pumpkin things, both 2006-07. 08 might of. 09 was pumpkin headband and pumpkin head! Off topic-ish: I comment saying stuff like "Oh I remember that from 2006" or something. You might click my penguin and check my pins and be like "Dude, you're from 2009..."
so that is where my memories come from! Since 2006 or 2007 till March of 2009. Then I got another until August of 2009. And then I got Muddy Duki! Off topic:There's another glitch I found,when you log into a room, some of the penguin names appear in the top left corner. Hello, Ron 68! Only put (CPG mod) next to your name when you're answering a question. Mimo! I need to tell you something! I went on Club Penguin today and guess what I found in the messages. EPF Agent- Psst. I want to be an EPF Agent. Can you send me an invite? Cool huh? I hope you give me credit! hey mimo i think i know what colours the party hat will be. Maybe its green with yellow because the ballons of the last week newspaper were that colors, and in the reviewed by you the colors of the penguins in the first screenshot are green and yellow. Hey Mimo, have you noticed if you click your player card the clothing etc on your penguin fades onto it. its so good. I've found a huge glitch on server Abominable! If you start dancing with nothing on, then put clothes on, the clothes will spin around you! This is seriously weird and not a lie! I've seen hundreds of penguins try it! Please give me credit! Thanks! Mimo, did you notice that the newspaper has more ninja stuff in it? like the Ask Aunt Artic part and the Classified Secret thing. Do you think it has something to do with the Card Jitsu Water? Good guess! we will have to wait and see if your right! Good finding but most people know about this glitch, Mimo has posted about it. Actually its aqua. Not really blue if u look carefully. i think this year `s part was not good like last times or beafor one i remember last time every one had to find the hat and a horse goes from the top and the hat fall and the train was good to that goos around the room but this time their was notting fun like train or horse the hats were in the box but last time it was little quis think like every one has to fing it...... ?